What 2000 Calories looks like. These types of demonstrations are always interesting to me. The most interesting part being the comparison of healthy and unhealthy foods in terms of amount of calories. For instance I was very pleased to see that a Cinnabon has the same amount of calories as a Cobb salad. I’m sure they’re just as equal in every other nutritional category as well. 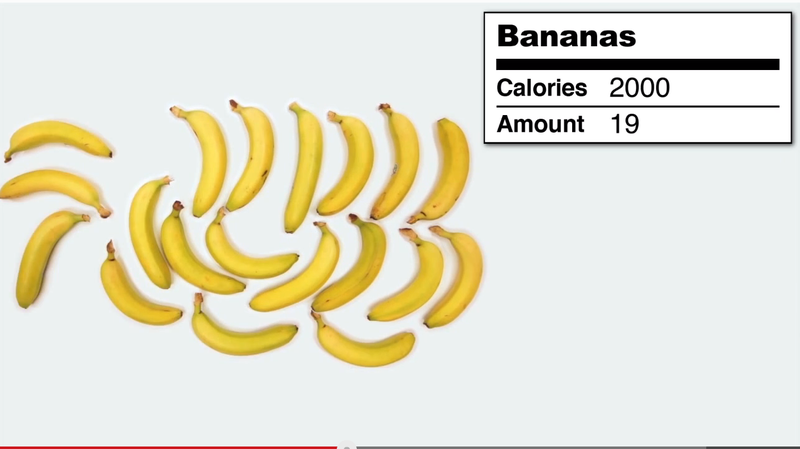 Author Posted on March 28, 2013 April 1, 2013 Categories miscellaneous, vidaday2 Comments on What 2000 Calories looks like. Note: Regular readers may have noticed some new authors for 2¢ Worth as well as some off-topic posts. It's all in an effort to simplify my work, combining my Citation Machine and new book blogs (Cultivating Your Personal Learning Network), as well as my son's video blog and daughter's infographics blog together with 2¢ Worth. The varied elements of this blog do have distinct URLs, as evidenced in the links. You can load only my shakabuku articles here. 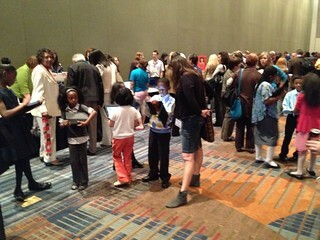 A few weeks ago I worked and attended North Carolina's ISTE affiliate conference. I opened the NCTIES conference with a breakfast keynote address and Marc Prensky closed it with a luncheon keynote the next day. Sadly, I missed the second day of the conference. I would first offer some constructive criticism to NCTIES, and to all such ed-tech conferences across the nation and around the world. You do a fabulous job of offering dynamic learning experiences for teachers who are new to teaching or new to utilizing contemporary information and communication technologies in their classrooms. What I find missing are opportunities for those of us who have been around the 10, 20 or 30 years. I attended a number of excellent and very well received and appreciated presentations, that did very little for me. I'm not complaining, except that these conferences need to continue to attract the more experienced ed-tech'ers, and not just to present sessions. The only idea I can think of is to have one or two session rooms devoted to unconference topics. Perhaps a different topic each session block or two-session block and before the conference try to seek out people to moderate those conversations. It would be important to have good moderators, not topic experts. Experienced educators can learn from shared experiences and those less seasoned can learn by attending as well. Just a thought. It was in the student showcase, a part of most ed-tech conferences that I often miss, using it as an opportunity to visit the exhibitors or dash up to my room for something or other. I am so SO glad that I attended the students' show and tell in Raleigh. My main surprise was a table with three youngsters seated behind, and some pictures of medieval paraphernalia, shields, cottages, etc. I asked for an explanation, and the girl, the middle student, proclaimed herself as Sir Janes (I don't recall her name). She gestured to the fellow on her left and said, “He's King Arnoald,” (again, I don't recall the real name), and to her right, “This is Squire Bob,” (not his real name). She then began telling me what they were doing, describing some of the communication skills they were learning as well as social studies and character. It was obvious that they were role-playing in some midevil style adventure game. So, being the nerd that I am, asked about the software they were using. In a similar vein was Sanderson High School, here in Raleigh, the high school that my children attended. Behind their table was three young men and a couple more students scurrying around behind them. They appeared to be work at computer keyboards, with extra flat monitors facing out to the wandering educators. I asked what they were doing, and they proceeded to explain, in rapid articulation (often too rapid for me to understand) that they were coding new features into various web sites for the school. It's relevant to note that until the recent retirement of the schools ROTC officer, Col Penny, they had used remnants of one of my older web projects, PiNet, a web site generator that integrated bookmarks, web forms etc. into school or coassroom web sites. Col. Penny had championed the school's web site and its purpose using PiNet and oust the tool way beyond what I had imagined. With his retirement, Jennifer Bennett came on board from Southeast Raleigh High School, a technology-oriented magnet school. An English teacher herself, Bennett worked with school librarian, Donna Hitchings to establish a class and a team of students to build and maintain a very impressive interactive school site, as well as web sites for the library and other facets of the school. They are also working on making their sites more social in how they are maintained. ..and did I say, Bennett is an English teacher. The team, who mostly train themselves and each other, work as consultants to the school, setting up meetings with teachers to assertion needs, and then devise and suggesting technical solutions. In their class, they discuss communication skills, collaboration, as well as design and much more. They're learning valuable skills within the context of a working an enterprise. Seeing this was energizing to me. What happens if you turn a class into a game? Students will share their work so far as participants in Earth Quest – a gamified Earth/Environmental science class taught at the high school level. This game, hosted on the class wiki, involves learning teams of students, called colonies, competing against one another to complete quests and earn points rather than completing traditional assignments. Students will share the characters they've developed, quests they've completed, and the challenges and benefits of learning in a gamified environment. Exploration seems to be the first step in everything. Before you can know what something is, know how it can help you, know if it’s dangerous, you have to actually go out and see it for the first time. It’s hard to imagine, but even after all of the exploring we’ve done on land, most of our planet still remains a mystery to us. Well explorers like Dave Gallo here have made it their life’s mission to reveal more of our world to us. Who knows what useful and interesting things that are out there just waiting to be seen and studied. 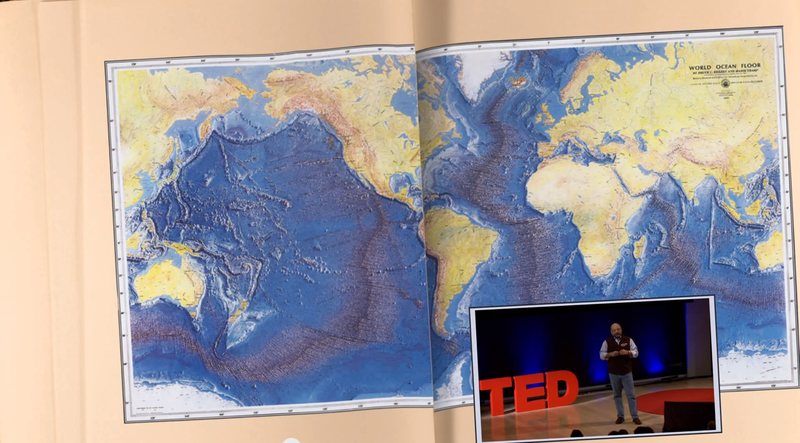 I wouldn’t be surprised if this talk he gave created a handful of future explorers who will give us even more. Contemporary literacy is a subject I’ve not written about in a while. In fact, I’ve not been asked to talk about it at a conference in a number of months. Is it a message that’s been received? I don’t think so. I continue to read comments on my blog promoting the integration of technology, like tech is the goal, rather than an essential tool for accomplishing the goal of contemporary learning-literacy. ..it is now our ethical responsibility, as information consumers, to assure that the information you are using is accurate, reliable, valid, and appropriate to what we are trying the achieve. In another time, we were mere consumers of content. Today we are full participants in the information economy and this compels us to accept new responsibilities that have, in my opinion, become a part of what it is to be literate today – contemporary literacy. We are no long held only to the value of the information we consume, but also to the information that we pass on or produce. This is what came to mind when I was browsing through my copy of MLA Handbook for Writers of Research Papers: Seventh Edition. Hey, you’ve got to find excitement where you can. I found a section with descriptions for formatting parenthetical notes (endnotes or footnotes) about cited sources. It describes two kinds of notes for documenting sources. 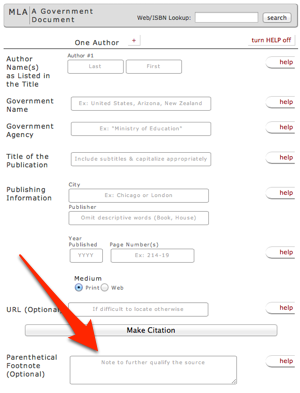 I added the footnotes form element just beneath the “Make Citation” button, so that it would not interrupt the normal flow of CM use. 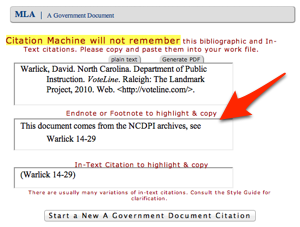 If a parenthetical footnote is provided, then the footnotes box will appear here between the bibliographic and the in-text citations. It seems that when we are all overwhelmed by information, much of it from other people like us, it is note merely a courtesy to cite our sources, but it is a practical measure to justify and invite readers to judge our sources’ accuracy, reliability and validity. We should make it easy for our readers to check its appropriateness to the message of our writing. With these MLA documentation notes (footnotes or endnotes), we can provide that justification where the comment does not really fit into the prose of the document. 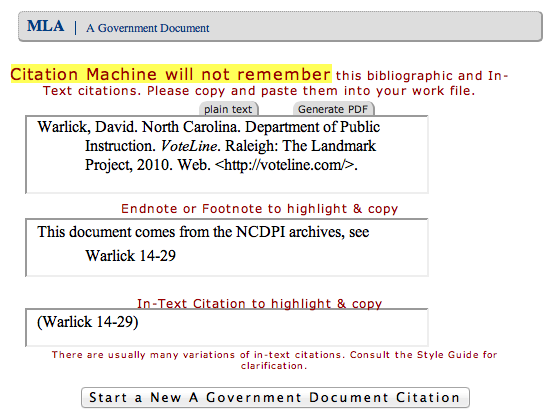 All of this leads up to a new feature on Citation Machine. 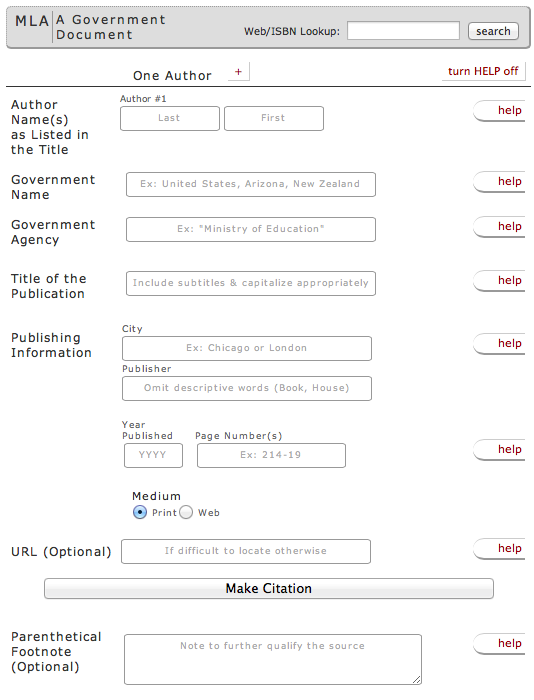 My plan is to add a textbox to all of the forms, where you have the option of typing in some “comment, explanation or information.” Citation will formate the comment, along with proper reference to the source, into a footnote/endnote. Thus far, I have only added the feature to MLA Government Publications. It seems that when ever I make any type of change to CM, a few people get disoriented, not to mention madder than a mule chewing on bumble bees. 😉 I understand this. What sets Citation Machine apart from most of the other citation generating sites is its simplicity and speed. Change does not simplify. So I thought I’d take this slow. Look at the Government Publication form and try it out. The note text shows up in a box just like the bibliographic and in-text citations. Feel free to comment on this blog post and concerns or recommendations. 1 Warlick, David. “Ethics Challenges & Information.” 2¢ Worth. The Landmark Project, 26 Jan 2007. Web. Web. 18 Mar. 2013. <http://davidwarlick.com/2cents/?p=858>. 2MLA Handbook for Writers of Research Papers: Seventh Edition. 7th. New York: Modern Language Association of America, 2009. 230. Print. Today’s infographic is interactive. It allows you to view various sessions of the Senate and view who voted the same during that session. It is very interesting to see what Dem and Rep are connected, and which vote independent of their party. For instance, during the current session, Senator Susan Collins voted with two Democrats and four Republicans 75% of the time. It is important to know how your representatives vote, and this is a great tool to see who votes without influence. Challenge your students to come up with reasons why Senators may be influenced to vote a certain way. Maybe the promise of a vote on another bill, or because there is something deeper inside the bill than is evident. Also, research a few bills and try to figure out why certain Senators voted a certain way, and others voted the other way. This infographic found on visual.ly is a great infographic about major wars of since America became a country. It goes through every war, from the American Revolution to post 9/11 and shows the amount of time spent in battle, the amount of money spent on war, and the number of lives lost. According to this infographic, America has spent half of it's its existence in war. Based on my knowledge of history, this is not terribly uncommon. Most countries have been in war in defense or offense over borders, money, or even love. Challenge your students to research some of the minor wars and find out the reasons behind them. This infographic is also a great example of how to create an infographic. It uses a gun as a timeline, and a bulls eye to show lives loss. It is a great example of how to use implements from the subject to who information in an infographic. 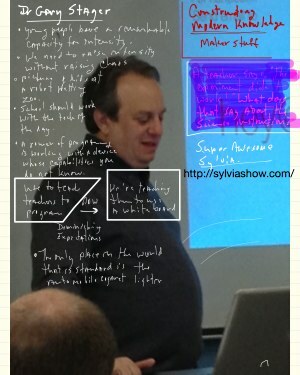 I tweeted a few minutes into his session that Gary Stager is a very funny man. I forget about his amazing sense of humor and I wish that I could share it here. But his sense of timing, which is a huge part of his delivery, simply couldn't be conveyed in text. 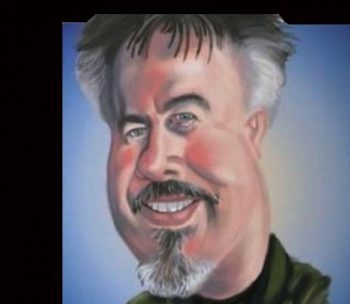 Of course, the best part of Gary's presentation was the “Ah ha!” moments, one after another. I'll list a few of them here. Stagger showed a picture of children in a robot petting zoo, a slightly disturbing image, on several levels. Shouldn't they be petting small farm animals. Well, sure. But from a contemporary learning stand point, a robot petting zoo gives children an opportunity to interact with emerging technologies in a playful way. ..and play, I suspect, is a huge part of learning to apply emerging tech. Why is it that we think it's alright for schools to use down-scaled and out-dated computers that would have been replaced years ago in most businesses, especially when most business uses of technology require less processing power than many classroom applications. If we are preparing them for their future (and ours) and helping them to become “lifelong learners,” then shouldn't they be using the most up-to-date learning tools? Why do we think that education should be cheap? What I remember my first experience with a personal computer (a TRS-80 Model I – from Radio Shack), I thought, “This is a machine that we operate by communicating with it.” This was brand new, and as a history teacher, this is what convinced me to learn as much about computers as I could. This technology, which you operate by learning its language, was going to change everything. In a sense, a personal computer is like a friend, in that the best way to learn about it is to communicate with it. He continued that this is an indication of “diminishing expectations.” Wow! In workshops, I use to teach BASIC programming and HTML. Shouldn't teachers be learning about computers by communicating with them? I've long thought that the reason I am able to intuitively figure out new software is that I've written software. I've had the same internal conversations that other software developers have had. In his much expected attack on “standards” and standardized testing, Stager reminded us that the only place in the world where we consistently see standardization is in our cars. it's the cigarette lighter. Finally, and this is one I've attributed to Gary during a number of my own recent talks and conversations. He tells the story of a science teacher, who, in the teachers lounge, complained that she tried a science experiment in her classroom, and “It didn't work.” This story says so much about what is wrong with our approach to education today. The experiment didn't work for the teacher, because it didn't teach what she wanted taught. Science is about answering inquery. It's about exploration and discovery, and it happens as a result of experimentation. All experiments work. They just tell us different things. What an amazing learning opportunity that surprise avails any teacher – wasted in this case, because she thought her classroom was about teaching, not about learning. 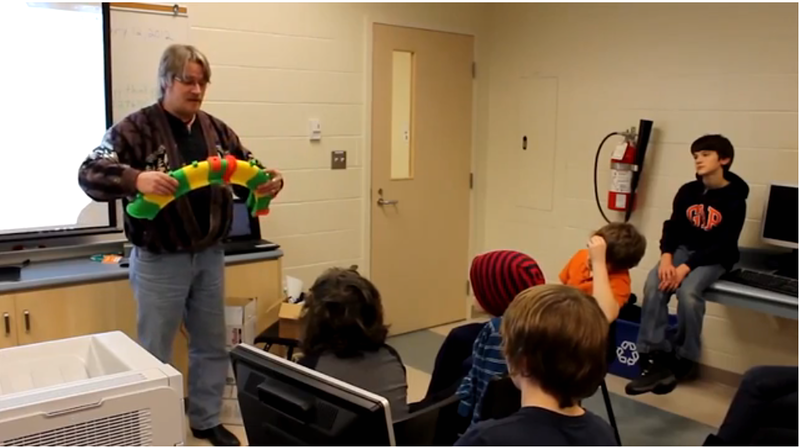 Watch Will 3D Printing Change the World? on PBS. See more from Off Book. When you first hear about 3D printing, it seems like a novelty, you can make random little models of whatever you like and there’s no real consequence. Well as it turns out, the 3D printer could be the most important thing to happen to the world of consumers and business in a long time. Check out this video to see why. Author Posted on March 12, 2013 April 2, 2013 Categories miscellaneous, vidadayLeave a comment on Will 3D Printing change the world? The other day I came up with a great way to give extra credit while strengthening your students. Giving extra credit for bringing in necessary supplies, such as tissues, is great, but students who give an extra push that will help them later on in life should get rewarded. Tangible rewards are one of the best ways to motivate students. In todays infographic, three major cities were surveyed based on the job skills employers in the cities seek. A lot of what was found was collaboration, project management, and internet skills. Well why not encourage your students to harness these skills in middle grades, upper grades, and even elementary grades, and reward them when they exhibit these skills. This can be done in multiple ways. By having your students come up with their own marketable skills they already have and give them a confidence booster by rewarding them with these. You can also compile a list of marketable skills with you students, and have each student choose a few to work on, and then later assign them to students to give the students something to work on. During assessments, if the students choose to go for this extra credit, have them outline how they used these marketable skills to complete the task. For instance, with collaboration, how did the students divide the work evenly based on each students skills? How did the students then come back together to share what they learned and put it together. Offer this explanation as extra credit. Many curriculums are teaching these marketable skills, but taking this extra step allows students to realize that this is a marketable skill and share how they used it, as well as receive feedback from you the teacher. Possibly even bring in professionals to give feedback. 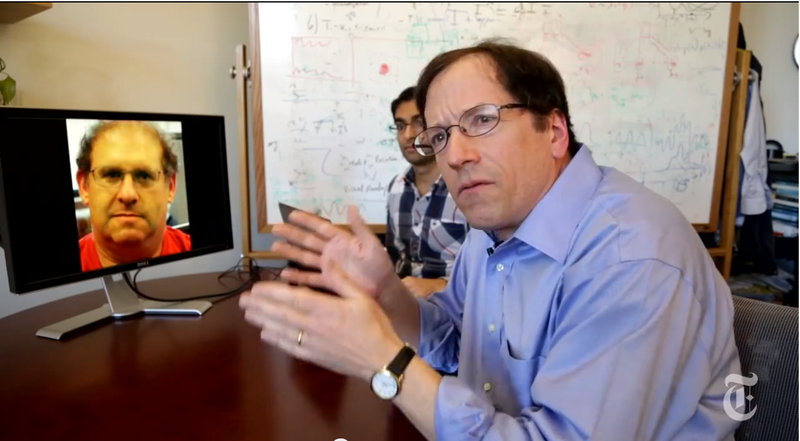 MIT – Exaggerating motion through video. Imagine if your simple photoshop skills could advance medical science. It’s possible that these people have done basically that. Using a sort of video filter, they are able to take video footage of any person and exaggerate the tiny movements they are making to give you more of an idea of how their vitals are doing. You can detect heartbeat, blood circulation, and breathing all with just a video image. I think it compares to things you can learn studying living things in slow motion, it kind of gives you another perspective for what’s going on. I’m all for stuff like this. Author Posted on March 11, 2013 April 2, 2013 Categories miscellaneous, vidaday1 Comment on MIT – Exaggerating motion through video.